SCOTUS will rule on Obama immigration executive actions. 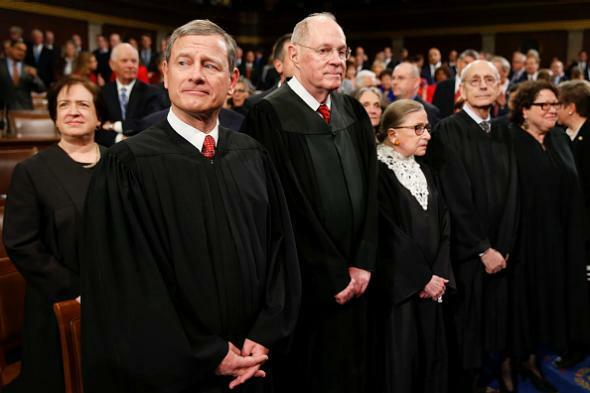 Supreme Court justices at the State of the Union address to Congress on Jan. 12, 2016. The Supreme Court will review President Obama’s plan to grant quasi-legal status to certain undocumented immigrant groups through executive action, the court announced Tuesday. The president’s plan, announced in November 2014, would officially defer legal action against undocumented individuals who were brought to the U.S. as children or who are the parents of U.S. citizens; it’s been blocked since February 2015 by a federal judge’s ruling. If the court rules in Obama’s favor, his administration will have a relatively short, seven-month window to try to roll out the expanded Deferred Action for Childhood Arrivals program and the new initiative called Deferred Action for Parents of Americans. While advocacy groups are eager to have illegal immigrants apply for the programs, there are questions about how many will do so if they’re debuted or expanded so close to the end of Obama’s presidency. As many as 5 million of the U.S.’s estimated 11 million undocumented immigrants could ultimately be eligible for deferred action under the Obama plan.